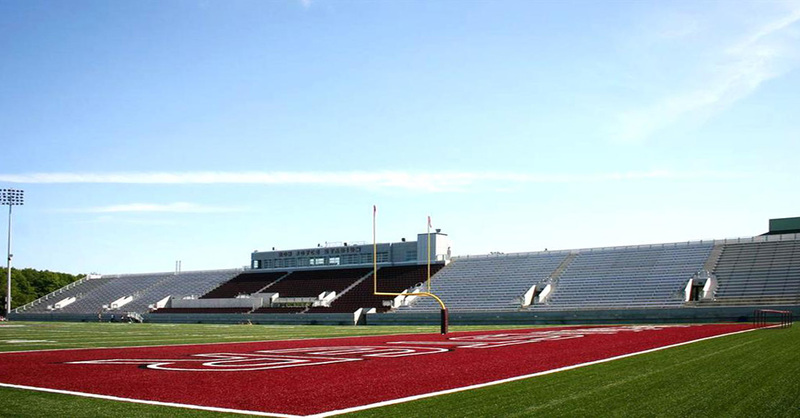 This 5,474 seat, 16,972 square foot, CFL sized, multipurpose stadium is home to the McMaster Marauder’s football, soccer, and rugby teams. While creatively engineered to be environmentally friendly and modern it is also able to solve McMaster’s parking shortage. Environmental initiatives in the design include new artificial turf made from recycled plastic, energy efficient lighting, and highly efficient mechanical and electrical systems running through the entire site. Electrical upgrades involved a state of the art sound system and video board, making the stadium more fan friendly. Able to hold 335 cars, underground parking was made underneath the field to cater the parking needs. Exceptionally designed, the stands all face west, away from the residences, with a media room on the deck. Behind the stands a wide concourse level was made for washrooms and concession while allowing plenty of circulation to the area. Another major improvement to the stadium is the 18,000 square foot, full service locker room vicinity. Members of Mantecon Partners were able to design an inviting new atmosphere for McMaster and its students through resourceful engineering and welcoming landscape. Architect: Diamond Schmitt Architects Inc.